A positive 8-0 vote at the FDA paves the way for first implanted CGM to come to the US; read what patient advocates and healthcare providers like about Eversense! On March 29, an advisory panel recommended that the US Food & Drug Administration (FDA) should approve Senseonics’s Eversense 90-day implantable continuous glucose monitoring system (CGM), on-body transmitter, and mobile app. The panel unanimously voted 8-0 that Eversense is safe, effective, and has benefits that outweigh any associated risks. This advisory panel vote makes it likely that the FDA will ultimately approve Eversense, bringing a new CGM option to the US. Senseonics has previously said that Eversense could be available in the US in the middle of 2018; the actual timing will depend on when the FDA approves it. What is truly novel about Eversense is the glucose sensor, which is the size of a small pill and stays implanted under the skin for 90 days. This long wear time minimizes the frequent through-the-skin needle insertions required with current CGMs, which are typically replaced every 7-14 days (Abbott, Dexcom, Medtronic). Eversense is implanted under the skin of a user’s upper arm in a five-minute procedure that can be done in a typical doctor’s office. Like other CGMs (see here for background on this technology), Eversense offers a real-time glucose value, a glucose trend arrow, and a lookback on recent readings. A slim rechargeable transmitter is worn on top of the skin (directly over the sensor), which provides power to the sensor (wirelessly) and relays the glucose data to a smartphone app every five minutes. The sensor requires two fingerstick calibrations per day – notably, both the Dexcom G6 and Abbott’s FreeStyle Libre do not require fingerstick calibrations. Though it is highly accurate, Senseonics is not seeking approval at this time to allow users to dose insulin based on CGM sensor readings. Eversense has been available in Europe since 2016, and Senseonics recently launched an extended length 180-day version. Initially, the US version will be 90 days. The company hopes to start a major study of 180-day version in the US this summer. 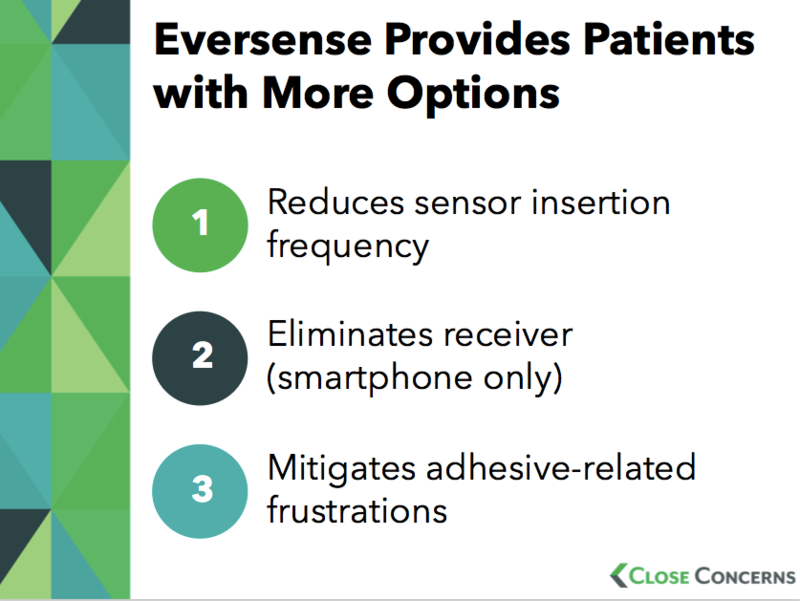 To learn more about Eversense and what was said at the recent FDA advisory panel meeting, read on, or click to jump to one of the sections below. What are people saying about the Eversense? What did the advisory panel vote mean? The 90-day sensor minimizes the number of sensor insertions, and has very strong accuracy throughout the wear period. In addition, for those currently wearing CGM, day #1 (right after insertion) has the worst accuracy. With a 90-day implant, day #1 occurs only four times per year. People with visual impairment or limited dexterity may also benefit from the longer sensor wear, as they do not need to worry about repeated weekly insertions. The insertion and removal procedure is quick and painless, leaving only a small cut. Health professionals said that they can integrate the procedure easily into their daily routines – that was cool to hear! Slide courtesy of Maeve Serino, Close Concerns associate who spoke at the open hearing. The Eversense transmitter’s milder adhesive seems to reduce skin irritation, a source of frustration for some current CGM users. Even if this is not an enormous number of users, for those that are impacted, it’s very challenging, and it’s great this is better with Eversense! Eversense’s transmitter can be removed without taking out the sensor – this can be meaningful for special occasions for some and for increased lifestyle flexibility. Users don’t have to worry about accidentally tearing out their sensor/transmitter and having to reinsert. The on-body transmitter provides vibration alarms that can notify users of highs and lows during situations when their phone is out of range. These alerts are particularly valuable to those who are visually impaired or have difficulty hearing or who want this option during times they prefer a subtle alert. More CGM options are needed to expand use of the technology. It is widely perceived that CGM is the most important advance in diabetes in recent years, and yet, for a variety of reasons, only a minority of people with diabetes are currently using it. Though access has certainly improved, it will be easier as the products become more straightforward and easier to use. Ability to see glucose readings from a smartphone or smartwatch, without having to carry an additional receiver device. Ability to see historical CGM data and patterns within the Eversense app, rather than on a separate app. When the FDA is considering approving a new sort of device, it sometimes calls together an Advisory Committee Meeting that seeks input on the approval. The same was true in July 2016, when Dexcom sought the first approval for CGM to be used for dosing insulin. In this case, the eight-person advisory panel voted on three topics related to the Eversense: 1) Safety, 2) Efficacy, and 3) The ratio of benefits to risks. On all three, the panel unanimously voted 8-0 in favor of Eversense, a resounding endorsement that the device is safe, effective, and beneficial. While this does not guarantee that Eversense will be approved – or when it might happen – it is definitely a positive sign. 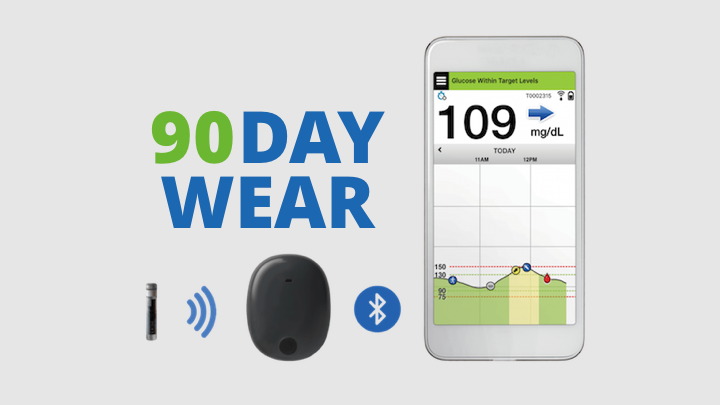 Offer the longest-lasting CGM sensor available in the US. Other approved systems like Dexcom’s G5 and G6, Abbott’s FreeStyle Libre, and Medtronic’s Guardian Sensor 3 require a new sensor insertion every 7-10 days. Bring a new highly accurate CGM to the market. The accuracy of Eversense looks to be on par with – or even slightly better than – the accuracy of other currently available CGM systems. Help expand the number of CGM options available with a new style of wear – implanted sensor and a small transmitter that can be taken off/on when desired – without needing to replace a sensor. CGM is currently used by less than 1% of people with diabetes worldwide, including only a minority of people who use insulin.